UNLEASHED RELOADED,THE NO.1 TALENT SHOWCASE AND FUN BLAST IS GONNA ROCK LAGOS AGAIN!! 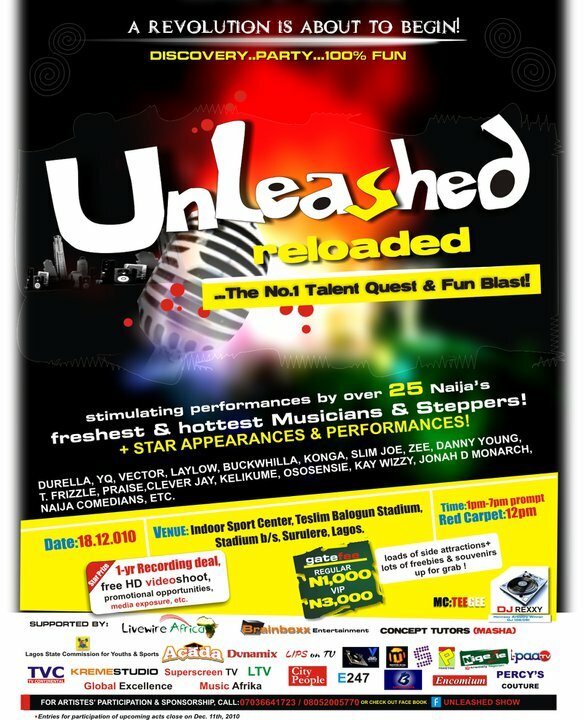 SAT.18TH, DEC, 2010 @ THE INDOOR SPORTS CENTER)TESLIM BALOGUN STADIUM, SURULERE, LAGOS FROM 12PM. GATE TICKET: REG(N1K), VIP(3K). PLS CALL SAM SMITH 08052005770 / 07036641723 FOR MORE INFO..
FUTURE AWARDS NOMINEES PARTY AND CHARITY BALL.